Scholar's Opinion: Opposing the Resolution "There's Too Much Government In My Life"
Rep. Paul Ryan, R-Wis., and ABC's George Will debate Rep. Barney Frank, D-Mass., and former Labor Secretary Robert Reich on the topic "There is Too Much Government in My Life." Brian Balogh is a professor of history at the University of Virginia. The following paper is in opposition to the resolution, "There's Too Much Government in My Life" debated on "This Week" on Sunday, Dec. 18. 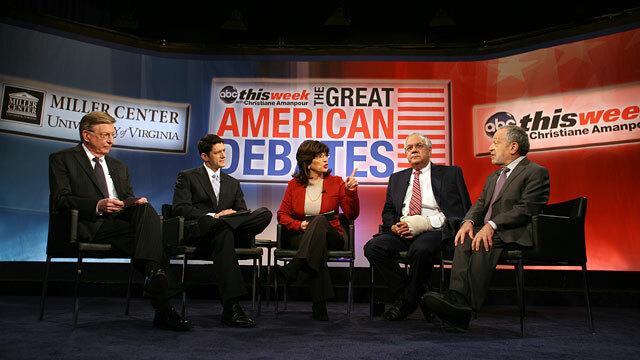 "There's Too Much Government In My life:" That was the resolution skillfully discussed in the inaugural "Great American Debate," sponsored by the University of Virginia's Miller Center and aired on ABC's "This Week with Christiane Amanpour." Predictably, Congressman Paul Ryan and pundit George Will, arguing the conservative position, stressed the magical qualities of the market. Congressman Barney Frank and former Clinton Secretary of Labor Robert Reich – team liberal – stressed the many intrusive and costly elements of government that conservatives support – from a hyperactive military to social regulations that penetrate deep into the bedroom. Surprisingly, neither side invoked much history. Yet a quick history quiz reveals that we are debating the wrong question. That is because the common ground that Americans have historically occupied is akin to a traffic circle located at the intersection of government, the market, and civil society. Whether citizens have arrived via State Street, Market Street, or United Way, they have consistently reached their destination safely and swiftly by merging, not swerving to the right or left. Question: How did freedom-loving, rights-bearing citizens in the early republic get their news? And how much did they pay for it? Answer: The U.S. Postal Service and just about nothing. The Postal Service was the CNN of its time. The USPS heavily subsidized the distribution of newspapers, shifting the cost to those customers who mailed private correspondence. Citizens and elected officials alike heartily endorsed these subsidies in order to create a union of informed citizens. The results shocked French observer Alexis de Tocqueville, who noted that there was "an astonishing circulation of letters and newspapers among these savage woods." True or False? A man's home is his castle: private property was a sacred right in America. Courts, especially in the nineteenth century, regularly settled the tension between owners of private property and the community's best interests in favor of the community. Safety and eminent domain trumped individual private interest more often than not. In 1788 a Pennsylvania Supreme Court justice, noting that "the safety of the people is a law above all others," confirmed the common practice of tearing down private homes, simply because they might stand in the path of a fire. To act otherwise would risk fueling the fire. The courts repeatedly favored the efficient use of property, as measured by the return to the entire community, when it came to riparian rights or the use of new technology. True or False? Private markets were more effective than public provision. Whether eliminating the barriers to interstate commerce, assuring the value of the dollar, squeezing out watered stock or ensuring the quality of standardized products like canned meats nationwide, markets were shaped and sustained by laws and government oversight. Quite often it was national business interests that demanded that government impose greater order and predictability. Ditto for litigation that appealed to the highest court in the land, overturning long-standing state responsibility for health and safety regulation in order to ensure unimpeded interstate commerce. No big government, no national market. True or False: Government cannot induce social mobility. Whether through the states' investment in massive university systems, the federal government's tuition payments for millions of returning World War II veterans or its legal intervention to dismantle the stifling regime of Jim Crow segregation, government has jump started and sustained the social mobility of tens of millions of Americans. If you have scored well on this test, or if the answers have enhanced your knowledge of history, you are poised to find common ground in today's contested political landscape. History suggests that when it comes to the core functions of building a communications infrastructure, demanding that property serve the larger goals of the community, ensuring that "private" markets and civil society function effectively, and that all Americans are well prepared to take advantage of economic opportunity, employing the full range of powers embodied in the Constitution has served the country best. Those powers include adapting the level of government to the scale and scope of the problem through the genius of federalism. They also authorize the use of deficit financing, a crucial tool during times of crisis – both economic and security-driven. In practice, Americans have rarely distinguished sharply between public and private. Rather, they have embraced a symbiotic relationship between government, markets and society. For extra credit, it behooves our public officials to put these lessons to work. They should employ public means and ends to stimulate private reconstruction of the nation's communication, transportation and educational infrastructure. They should stimulate social mobility through investments in key sectors of the economy, as our predecessors did for rail, automobile travel, computing, and the internet. They should insist that markets operate transparently and equitably. Nothing could be more American. Brian Balogh is the author of "A Government out of Sight: The Mystery of National Authority in Nineteenth-Century America" (Cambridge University Press, 2009). He is the Compton Professor and chairs the National Fellowship Program at the University of Virginia's Miller Center and is a professor in U. Va's Department of History. He is also "Twentieth-Century Guy" on the public radio show "Backstory with the American History Guys."